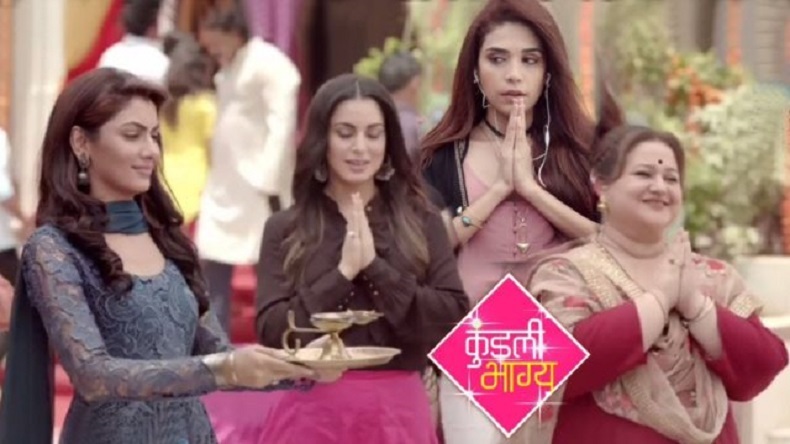 Kundali Bhagya 13 August 2018 full episode written update: Jealous of seeing Preeta and Karan sharing the stage, Prithvi surprises everybody by taking over the stage in order to dance with his fiancé. Meanwhile, Rakhi was upset as Karina called Sarla up despite knowing about the issues they are having. Kundali Bhagya 13 August 2018 full episode written update: Angry Prithvi scolds Sherlins on why she came to the venue. To which Sherlin was noted saying that she came to help him out but Prithvi wanted him to go back to the car and forced her to go back. On the other hand, Prithvi asks Manisha to inform him where Preeta and Karan are and where did the two go. Meanwhile, Sarla receives a call from Rakhi. Rakhi wanted both Sarla and Preeta to come to their house but Sarla refuses and suggests Rakhi to call Preeta if her new Physio wants to know something. In the scene, Sarla was noted saying that she doesn’t want them to insult Preeta and this is the reason why she is not allowing her to go to their house. Rakhi says that she is ashamed of the ways Karina talked to Preeta and is asking for forgiveness. In the scene, Sarla was noted saying that she doesn’t want them to insult Preeta and this is the reason why she is not allowing her to go to their house. Rakhi says that she is ashamed of the ways Karina talked to Preeta and is asking for forgiveness. Karan and Preeta took over the stage after Karan asks Preeta to dance. Jealous of the fact that Preeta would share the stage with Karan, he immediately came to the dance floor to dance with his fiancé. Prithni gets rude and tough with Preeta on the stagea. Karan gets uncomfortable after watching Preeta in that condition. On the other hand, Sherlin thinks that Prithvi is not working according to the plans. Karina asks Rakhi why she called up Sarla. While fighting to Rakhi, Karina said that she only wants the good of her family. Mahesh hears the entire conversation and gets angry at Rakhi. Rakhi apologises to Karina. To which Karina says that she will do anything to protect her family. While walking, Sameer bumps into Sherlin and apologies to her. Sherlin regognises him when Sameer tries to help her but she tries to hide herself from him. He tries to find out about the owner of the bag. Sameer gives Shrishti a call and is about to say something but she is very angry and at the end scolds him. Shrishti blames Sameer that he doesn’t care instead he was busy enjoying the party, she also says that he does not care to call and ignores when it comes to her feelings. To which Sameer asked, if she is a mind reader as he feels the same when she is not around. While talking to her on call, he drops Sherlin’s bags. On the other hand, Sherlin gets worried thinking what will happen if he sees her driving license, just when he is about to see it she sends a waiter to collect it and he takes the things away.